We’ve always said that great photos make great Christmas cards, and this Featured Favorite is proof. We love the way the tropical colors and gold foil pop off the black chalkboard background. Our Minnesota team couldn’t help being drawn in by the warm-location photos and reached out to ask where these photos were taken. Mom, Soo, responded, “We are a home schooling family on the Big Island of Hawaii—transplanted on a whim from Falls Church, VA, 15 years ago. We aren’t really beach people though, so we picked our golf club as the location for our annual family shoot. “This is my 2nd or 3rd time using Pear Tree Greetings for our annual Christmas card. I always get rave reviews! I almost always choose a card with gold foil—I think it is so Christmas-y and adds an extra oomph. The chalkboard background was on trend this year and I like my cards to signify the time period as well as show family and friends how the kids have grown! Everyone at Pear Tree agrees that we would love getting a card like this in the cold of winter. We hope this featured favorite inspires you to send your own warm greetings. 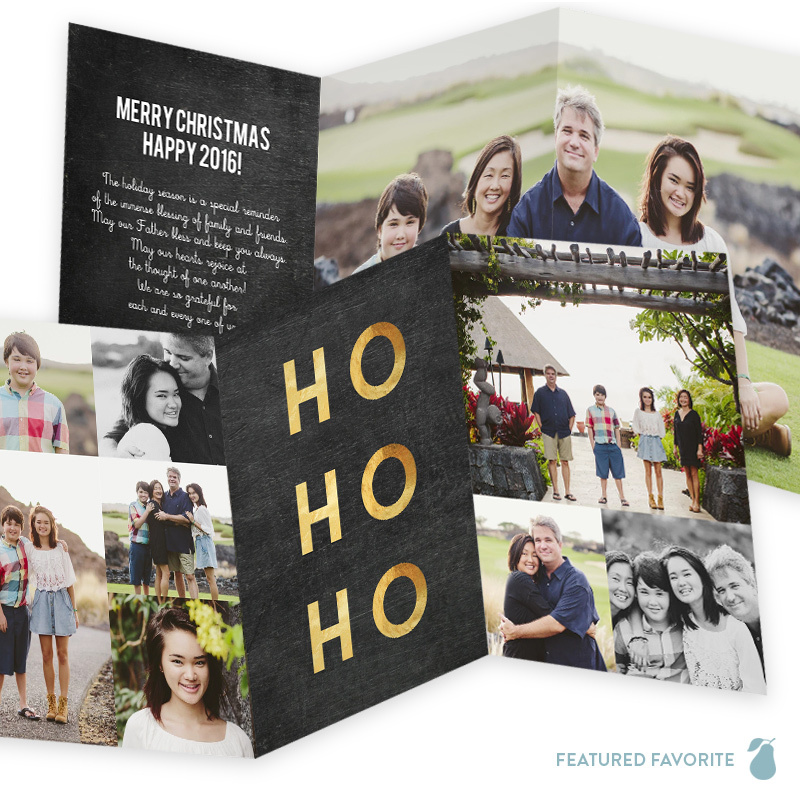 Shop the Ho Ho Ho Trifold, or see our entire collection of holiday photo cards for more ideas.